Each of these components has a cost associated with it. Use of Weighted Average Cost of Capital comes usually at a time during merger and acquisition. Some financial analysts look at WACC objectively to examine the capital structure of the company and whether it is running at an optimal rate, or things could be tweaked for bettering the value provided to shareholders, as well as to optimize the value of the organization’s finances. The recommendations made by financial analysts after examining capital structures include either carrying more debt, less debt or issue more common/preferred shares, pay off debt and issue more equity, or trade debts with different interest rates. 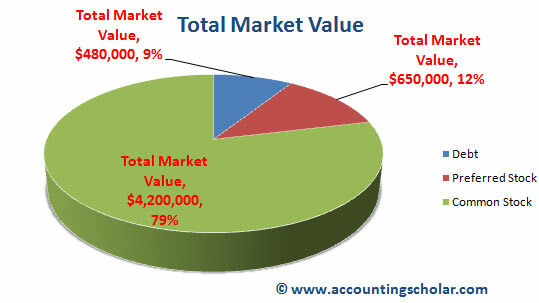 Below is graphical representation of the market value of the weighted average cost of capital calculations. It shows how the capital structure is divided in to 3 parts consisting of $480,000 debt (9% in blue), $650,000 of preferred stock (12% in pink) and $4,200,000 of common stock (79% in green).